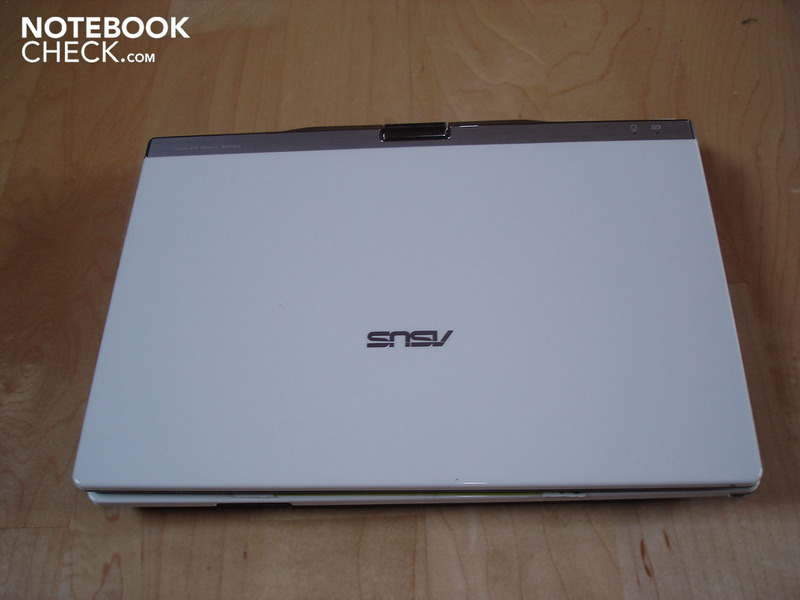 Has Asus turned the corner in tablet design? 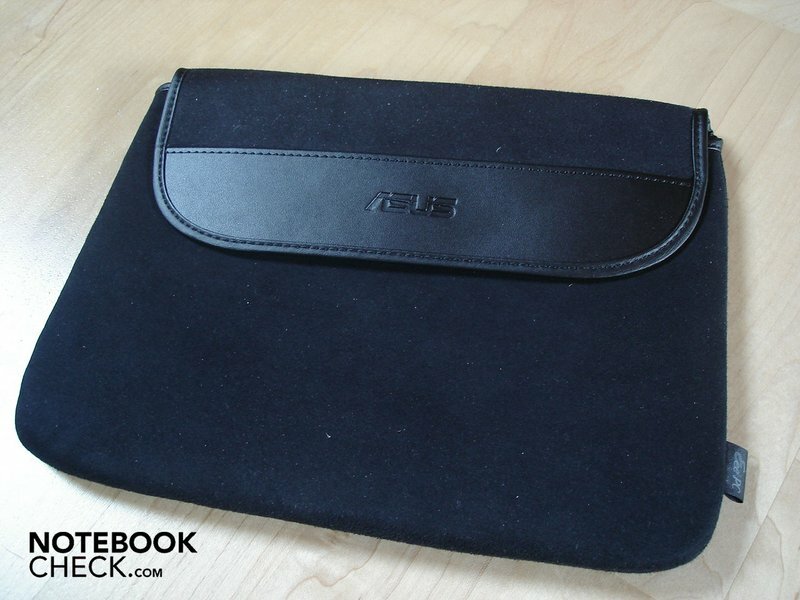 While other companies offer larger, higher performance tablets at a premium price, Asus has remained focused on netbook-style size and performance with its T91 MT, appealing to a much broader market with the relatively low price of €500. 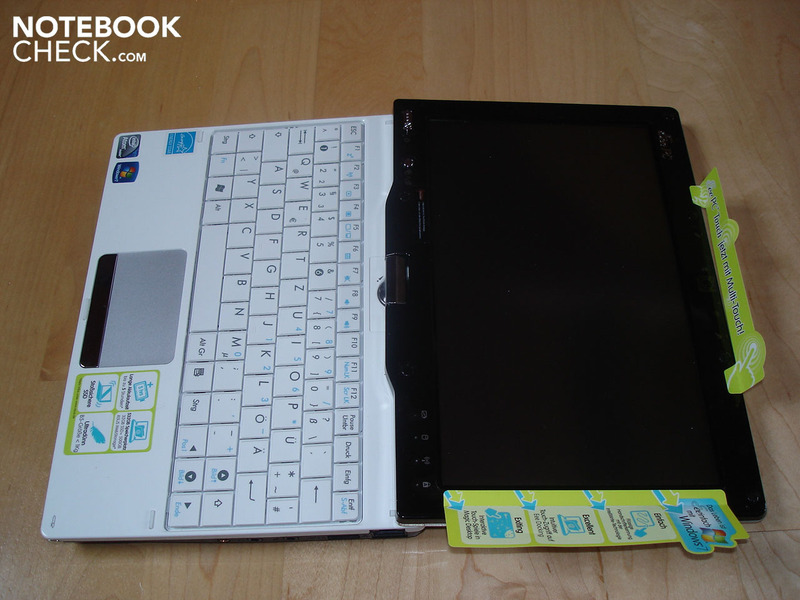 We took a closer look at the convertible tablet; find out what we uncovered in this review. 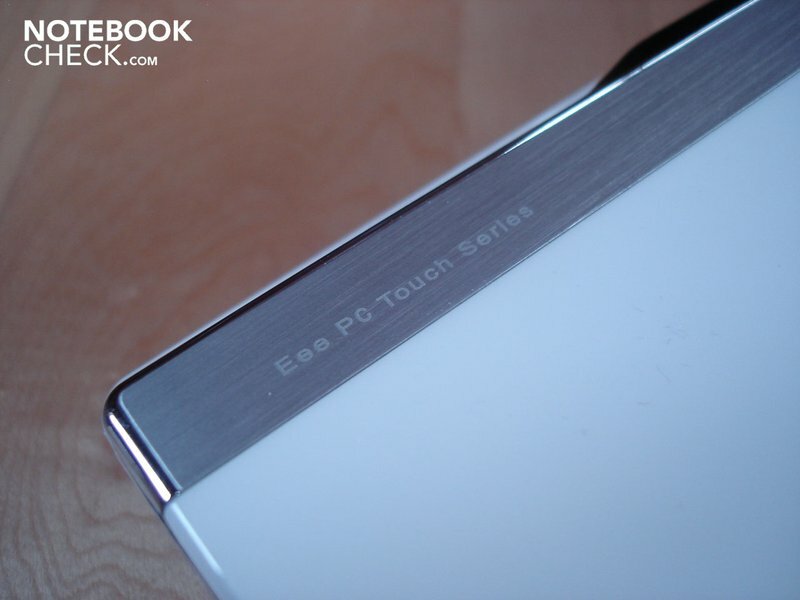 Asus's little Eee PC T91 tablet has been on the market for some time already. 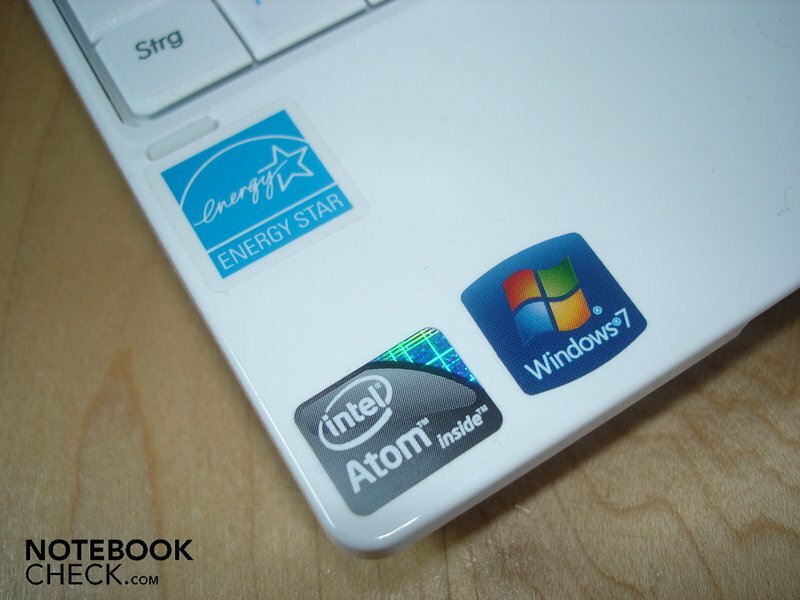 The processor is a Z520 (1.33 GHz), one of Intel's energy-efficient Atom range. Graphics processing is handled by Intel's low-performance Graphics Media Accelerator 500. The memory consists of only 1 GB of DDR2 RAM. The hard drive is a small 16 GB SSD. 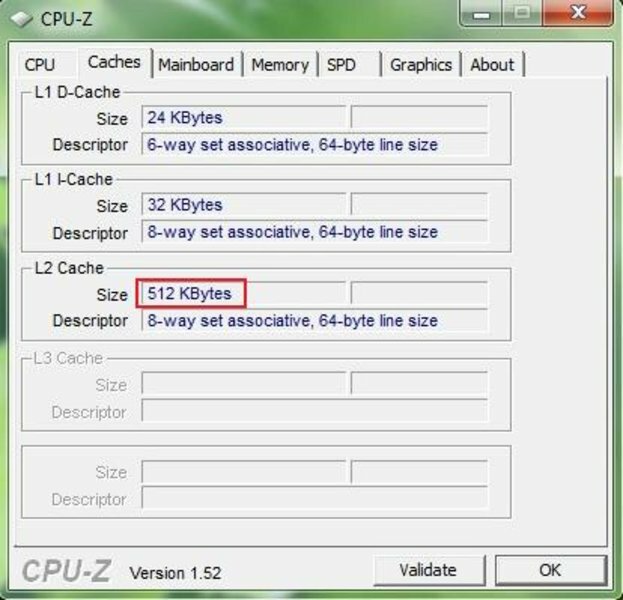 Since 16 GB is quickly exhausted, even with the relatively undemanding Windows XP operating system, an SD card is included which is also 16 GB, so that it can act as additional storage space in the so-called disk expander slot. 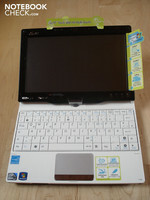 The Eee PC T91 is small and compact, thanks to its 8.9-inch screen, which has a native resolution of 1024 x 600. 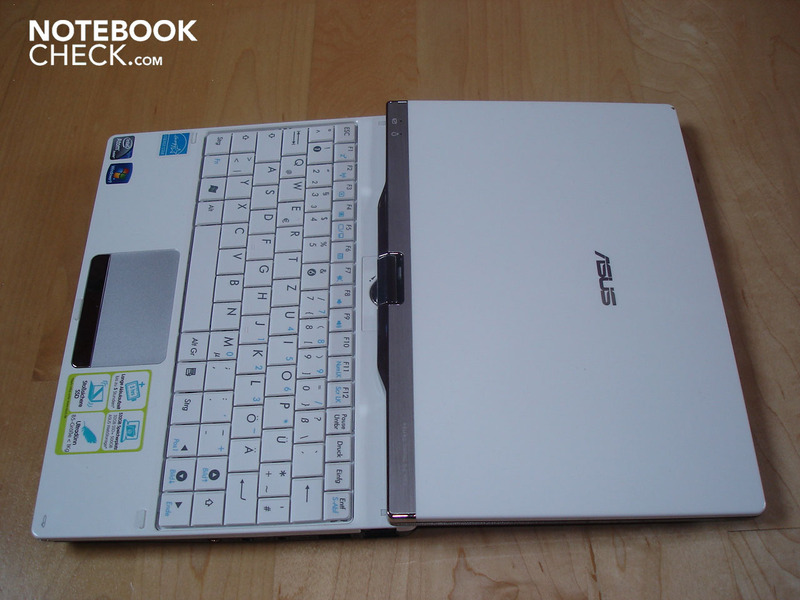 Since the release of Windows 7, Asus has brought out a new model called the T91 MT. Other than the move from Windows XP to Windows 7 Home Premium, not much has changed. For instance the battery life is still given as up to 5 hours. 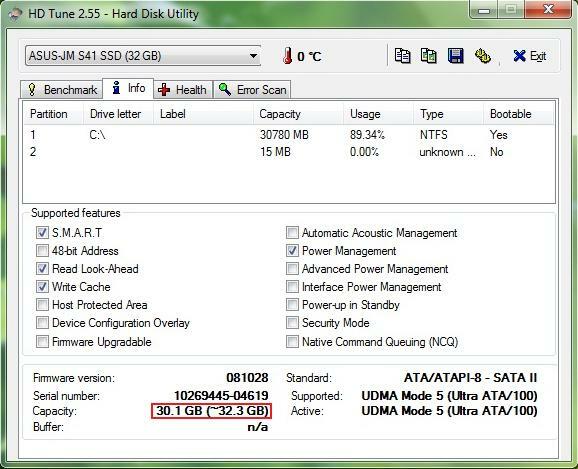 However the hard drive capacity has been doubled from 16 to 32 GB (SSD). But do watch out: the old version with 16 GB SSD + 16 GB SD still lingers on in some retail outlets for the same price of around €500. The T91 MT is currently available in two colours: black and white. We decided on the white variety for the purposes of this review. Because of the glossy surfaces, white has the distinct advantage that the smudges and fingerprints that quickly accumulate do not show up as much. In terms of design, the T91 MT is unobtrusive, with just a few silver elements providing the occasional pleasant accent. Though it is mainly constructed out of plastic, the case still seems of a very high quality, both visually and to the touch. There can be no complaints about the workmanship, with everything sitting well in its place; no sharp edges or other such problems were apparent. We were not totally convinced by the robustness of the case. The lid is relatively resistant to twisting forces, but putting pressure on the outside of the lid quickly leads to substantial screen distortions. The rest of the casing is surprisingly robust both on the underside and the upper side. The keyboard only flexes a little under heavy pressure. The single hinge, with which the lid can be turned completely around, works extremely reliably and holds the display in the desired position at all times. However one disadvantage is that opening the lid with one hand causes the rest of the case to follow. The T91 MT is tremendously portable with its low weight of only 970g and highly compact dimensions of 225 x 164 x 28.5 mm (length x width x height); there is room for it even when you have very little space to spare. The range of ports is not exactly what you would call extensive. On the back there is nothing but a VGA output, for connecting the T91 MT to an external monitor. However the picture quality via VGA is not great compared to DVI, DisplayPort or HDMI. The left-hand side sports the power socket, a USB 2.0 port and the so-called disk expander. Those expecting to find a straightforward card reader behind the cover here are only partly right. Because the capacity of the integrated SSD is so severely limited, you can insert an MMC or SD (SDHC) card into the disk expander. This shows up on the computer as an additional hard drive (as opposed to a removable drive) and so functions as an extension to the hard drive space. 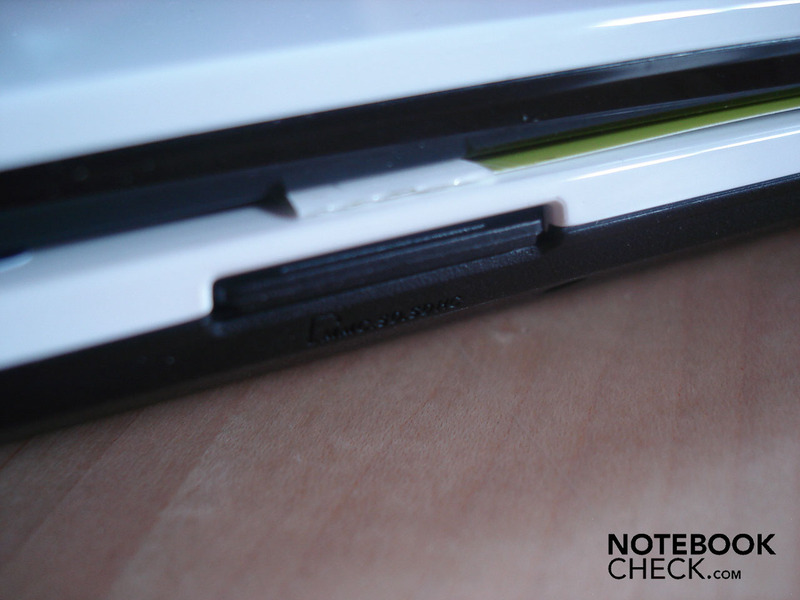 A real card reader can be found on the front of the notebook. Like the disk expander it supports MMC and SD (SDHC) formats. 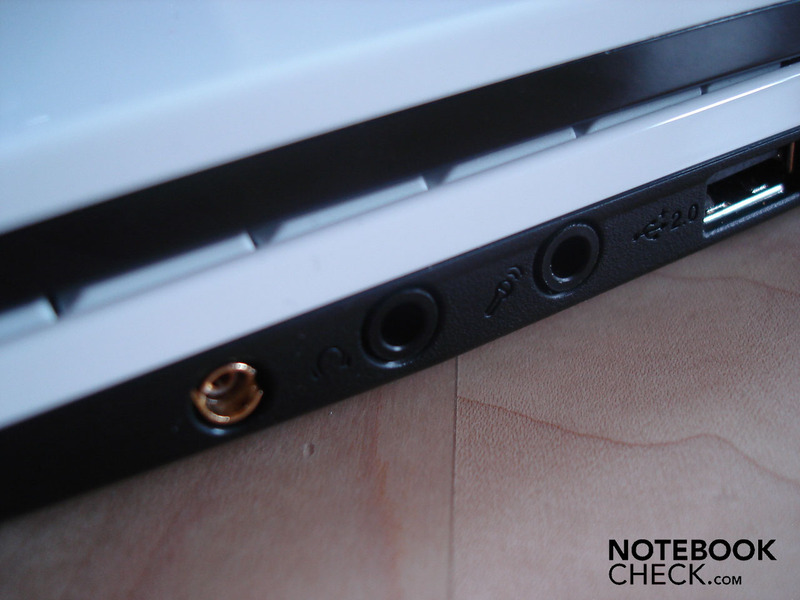 The right-hand side of the notebook features an antenna input socket and two audio ports (headphone and microphone), followed by a further USB 2.0 port and an RJ-45 LAN port. So while the choice of ports is not comprehensive by any means, on the whole it does include everything important for everyday needs. On the wireless side of things, it also has WLAN (b/g/n) and Bluetooth (2.1). In addition the T91 MT has an integrated webcam, though this only has a 0.3 megapixel resolution. 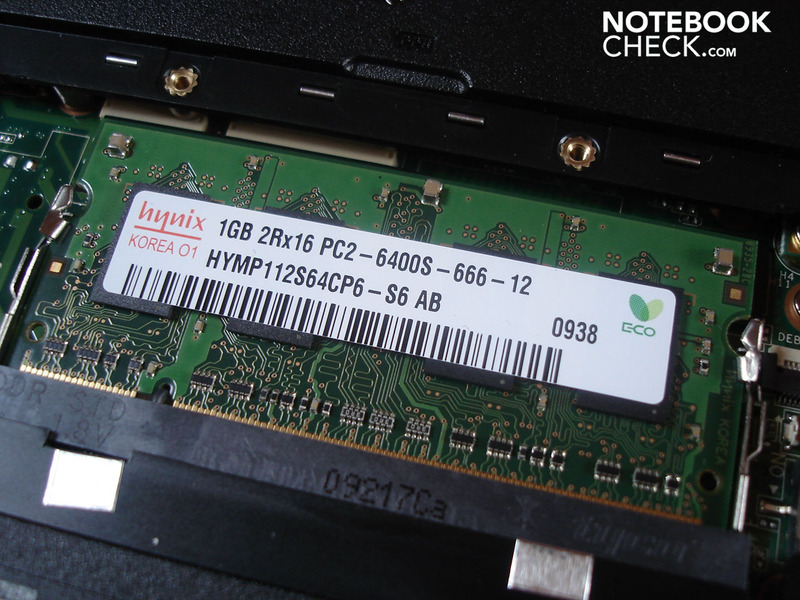 Asus has crammed dozens of programs and tools into the system, failing to take into account the notebook's low-performance components. 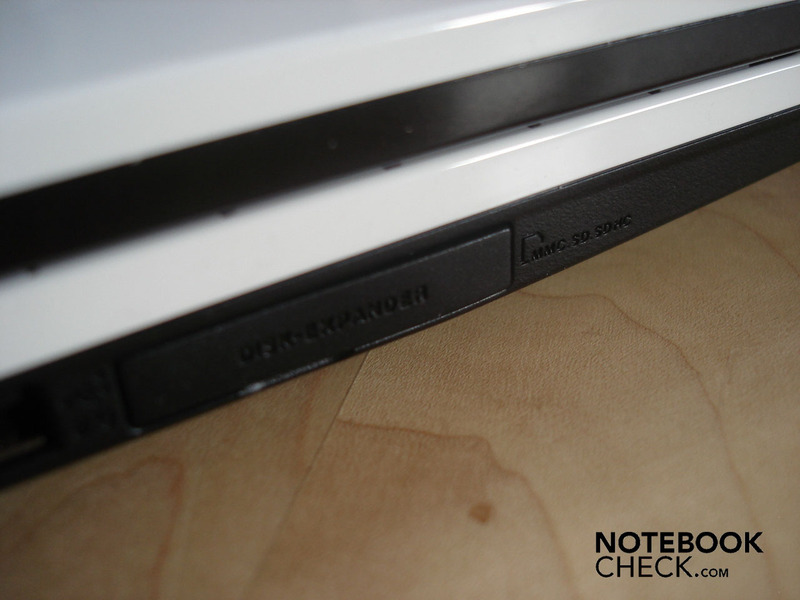 The result is that the notebook's system speed in its initial state is quite simply an affront. Start-up takes an age, not least because of the great number of applications which are set to activate automatically, and the Eee PC reacts very slowly, especially just after the operating system has loaded. 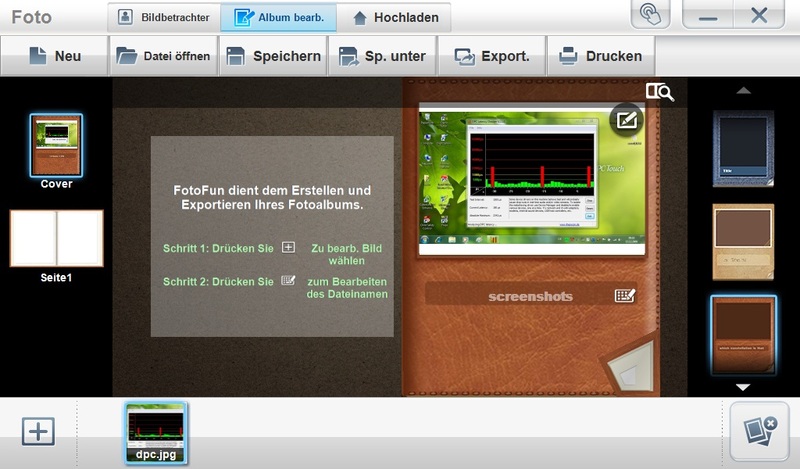 You can read more about the running speed of the notebook in the 'Performance' section. While much of the pre-installed software is wholly unnecessary, we would like to describe a few significant and interesting examples. 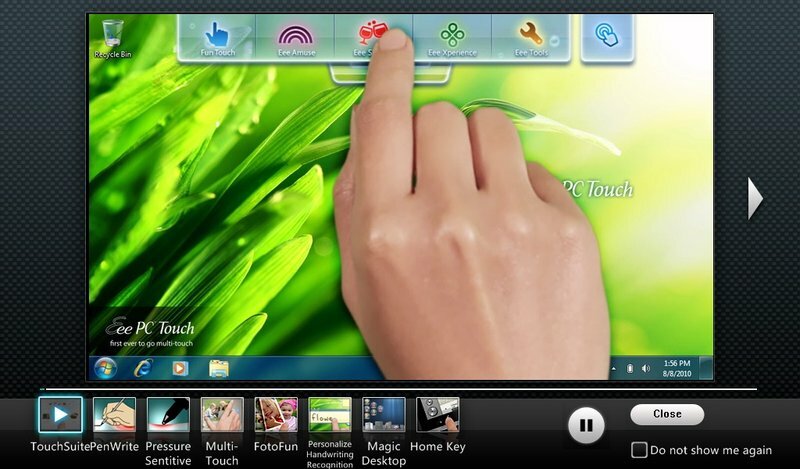 The so-called Eee Docking Touch program, as the name suggests, can dock to any side of the screen and gives you access to much of the integrated software; it is the central hub and first port of call for these. If you like this toolbar, you can have Eee Docking Touch load on start-up; if it starts to get on your nerves you can deactivate it through its settings. Before you get down to using any of the numerous functions of the T91 MT, you should take the time to watch some of its numerous tutorials. 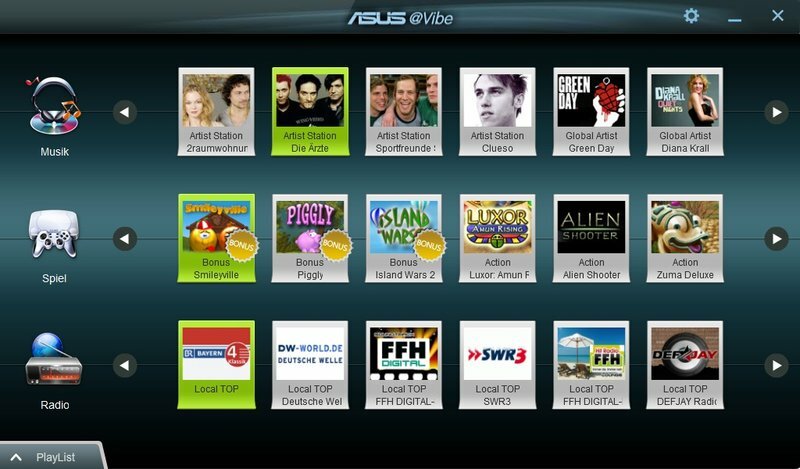 The videos, even without words, are very clear and easy to follow, and are a good introduction to the capabilities of the Asus tablet. Although inputting information by hand or with the pen is already very accurate on its default settings, it is recommended that you calibrate the screen. This is practically self-explanatory and can be accomplished in no time at all. 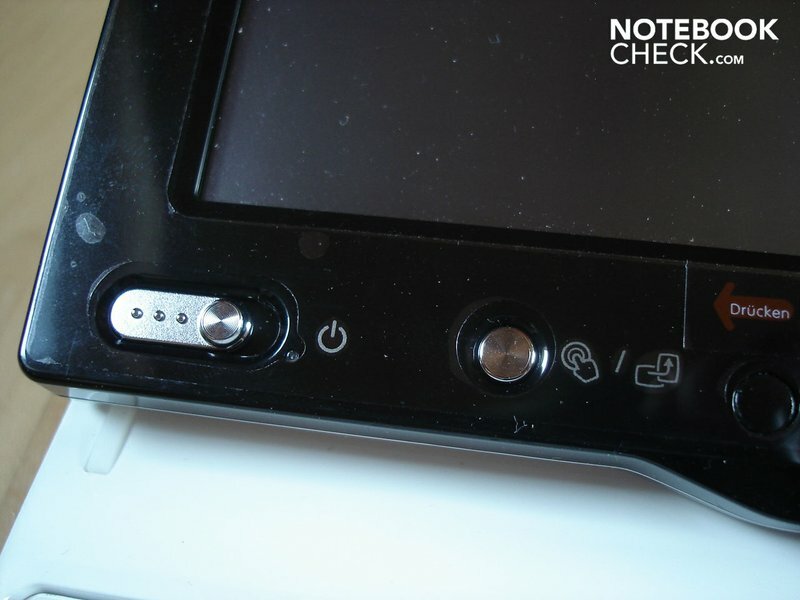 As soon as you touch the display with a finger or pen, a small icon appears on the left-hand edge of the screen. You click on this icon to bring up either the on-screen keyboard or the writing pad. The writing pad recognises text as it is written, converting it so that it can be entered in text fields, address bars and so on. 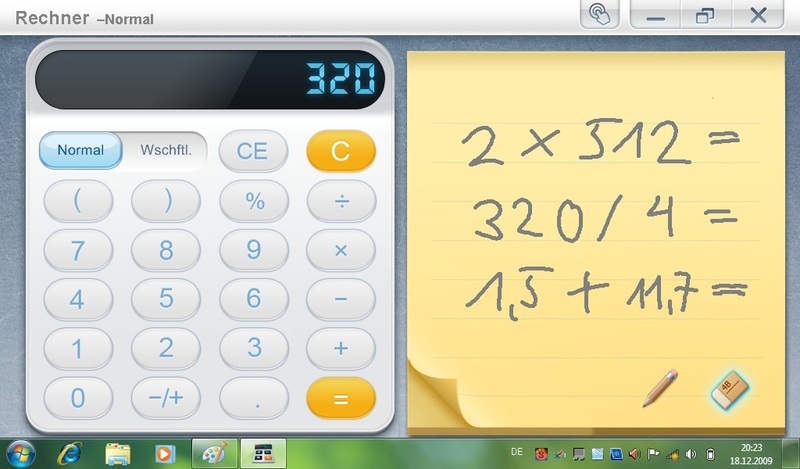 And users wanting to write a quick memo can do this using the very practical 'journal' tool. 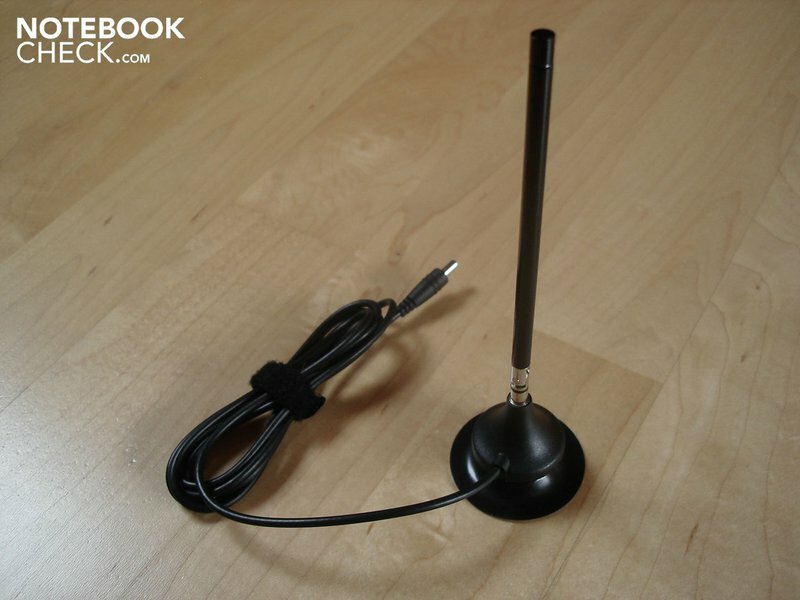 Asus has included a small antenna and cable, to be used with the notebook's integrated DVB tuner and antenna connection. But for us the real highlight was the carry case which was included. This is well put together, and made out of a thick and incredibly soft material. So there is nothing to stop you from taking the notebook with you on a trip, knowing that it will be well-protected against adverse weather and cold winter temperatures. Sadly, however, it doesn't have a compartment for the (small) mains adaptor. 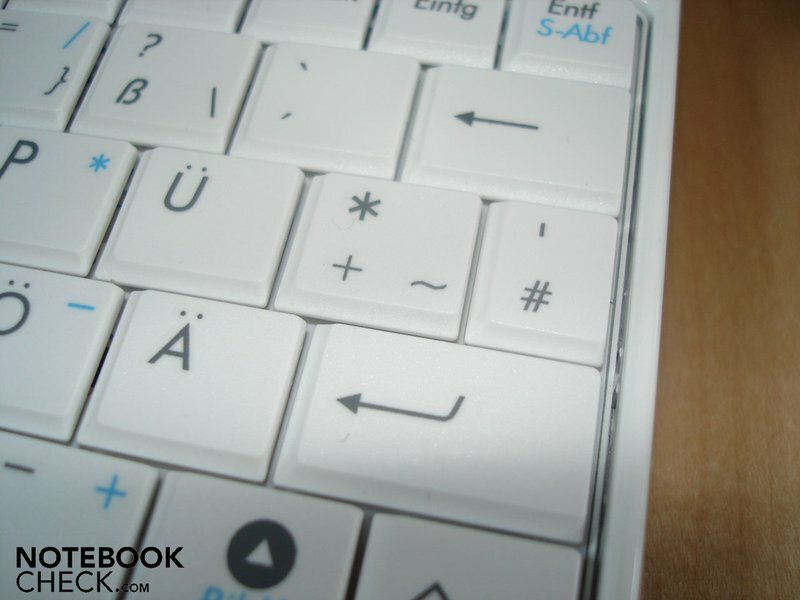 The keys are necessarily small, due to the notebook's small size overall. 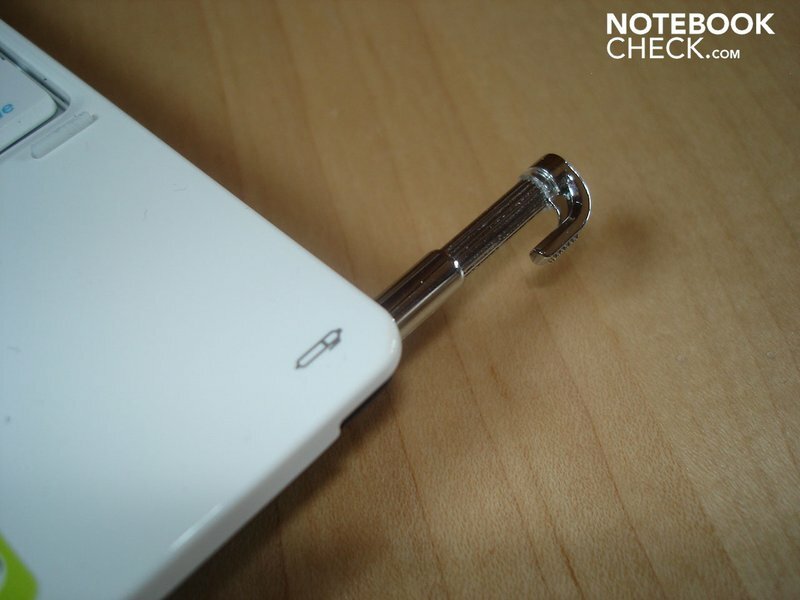 While the keys on other notebooks are generally around 18mm, the T91 MT's are only around 15mm. This doesn't sound like much, but it makes a big difference in practice. If you have less than delicate fingers or are trying to type very quickly you will often hit the wrong key. A couple of keys have been reduced in size still further (the ones with °^ and '# on them). 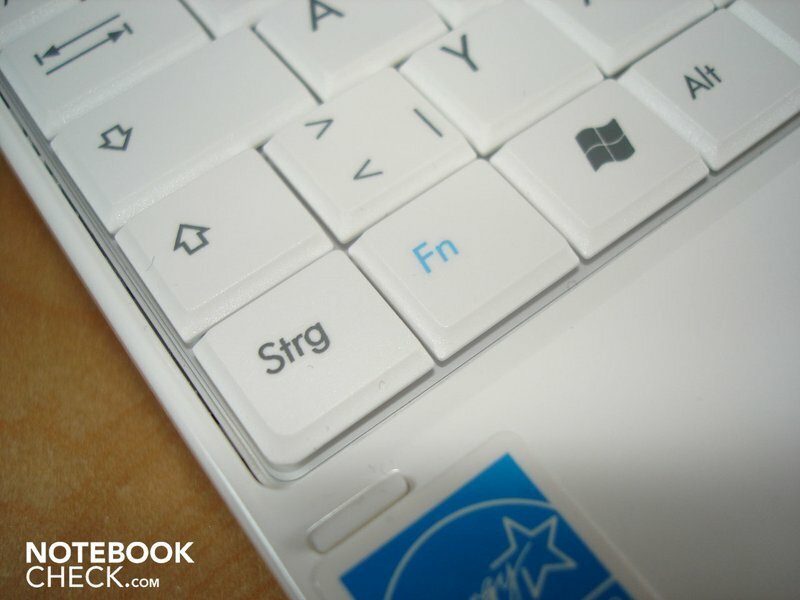 Asus has had to play about a bit with the layout too, moving the right shift-key and the '# key from their usual places. But on the whole it is easy to get used to the slightly altered layout. 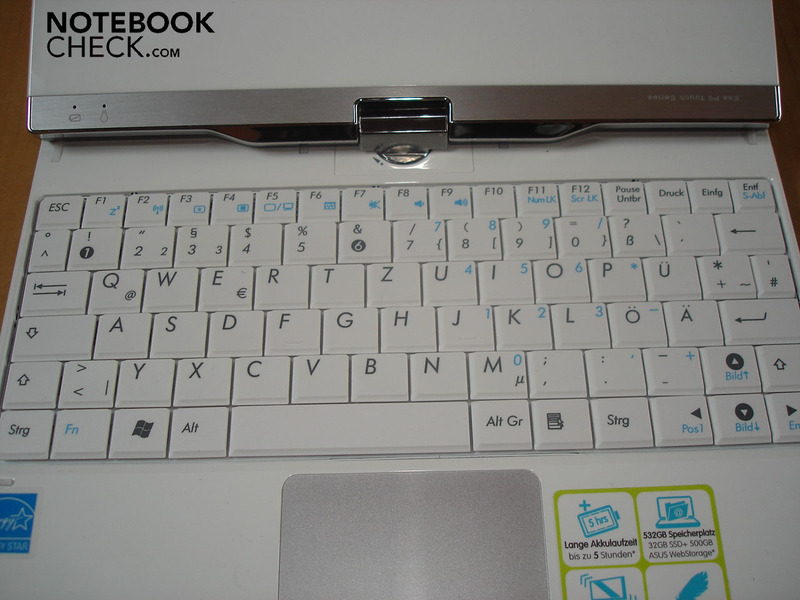 Unsurprisingly, the user will have to do without a separate number pad, but there is a number block integrated into the main keyboard which can be accessed using the function key. We found the T91 MT to be very convincing in terms of the tactile feedback from the keys, and only the noise upon release seemed a little rattly. As already mentioned, the keyboard does flex slightly in places, but this only happens when you apply a considerable amount of force to it. 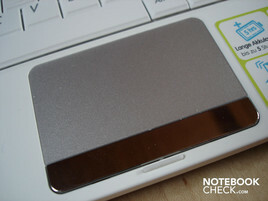 The touchpad is slightly recessed and can be easily distinguished from the surrounding area due to its silvery colour. It is not especially big, but completely acceptable for a machine about the size of a netbook. 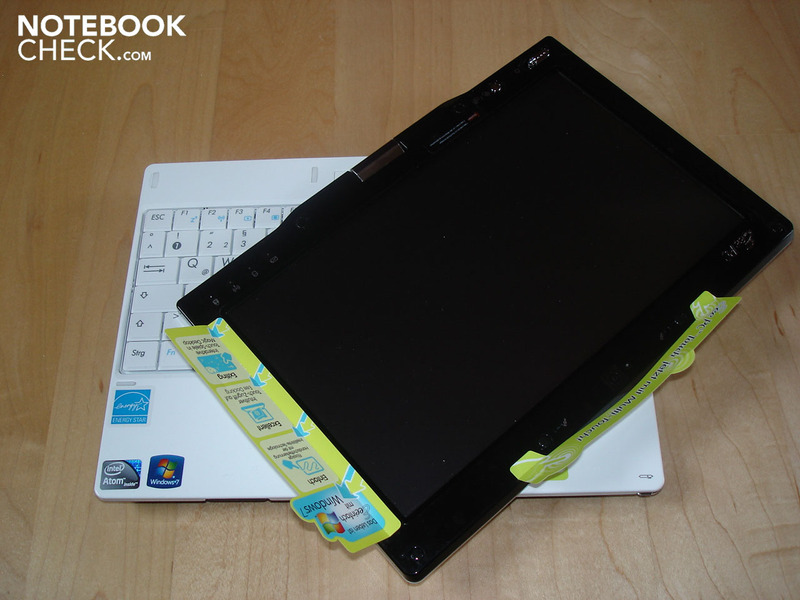 While we were testing it the touchpad also proved itself to be extremely accurate. The smooth surface means that your finger glides over it very well. 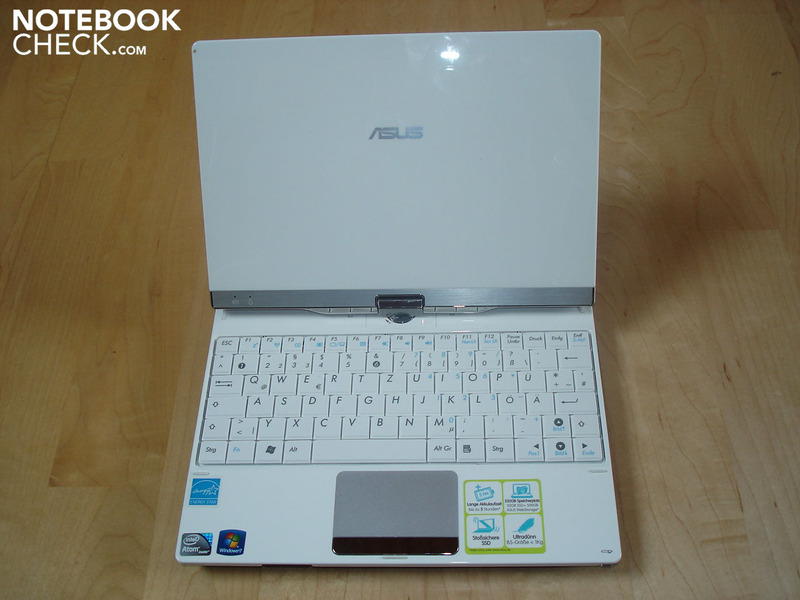 Fortunately Asus has not gone for the dimpled touchpad surface that it has used previously, for example on the Eee PC 1005HA, which is unpleasant to use for long periods. 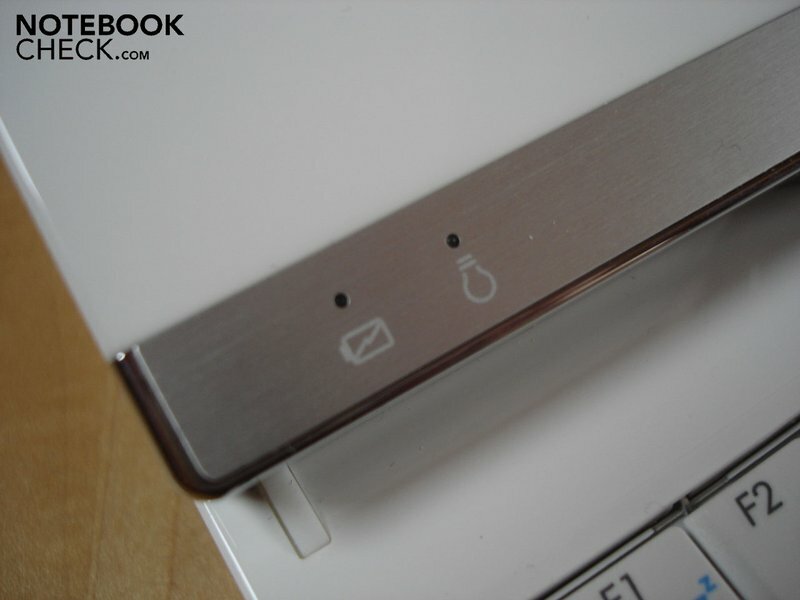 Beneath the touchpad there is a single bar containing both touchpad buttons, which quickly attract fingerprints because of their high-gloss silvery surface. The left-hand button was acceptable in terms of tactile feedback, but the right-hand button seemed to us to have a somewhat spongy feel. The touch-sensitive surface of the screen works exceptionally well. Whether entering information by hand or with the pen, it is correctly understood every time. 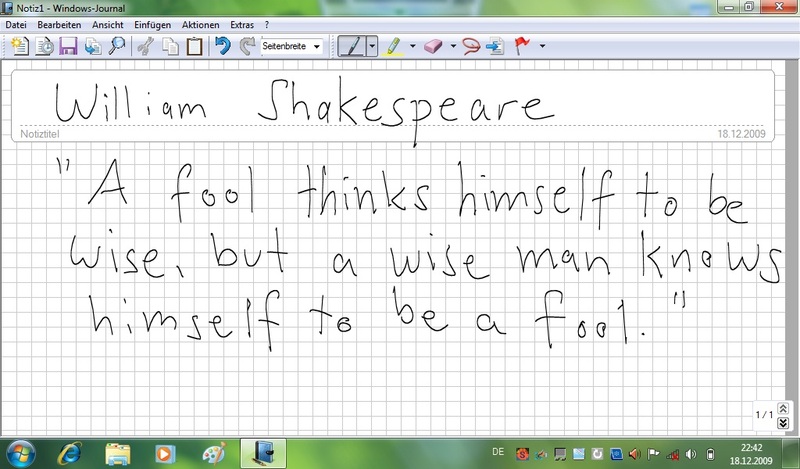 The handwriting recognition also works very well for the most part, with only the odd exception here and there. Even if you write very messily, the software converts most words reliably. Unfortunately there is a delay, varying in length depending on how much processing power is free, and this can be a pain, especially during short or time-sensitive tasks. One further shortcoming: it is not possible to rest your palms fully on the display, as this will render the touch recognition either partly or wholly unusable. So after a while some tiredness and tension may start to creep in. The T91 MT's 8.9-inch screen has a native resolution of 1024 x 600. 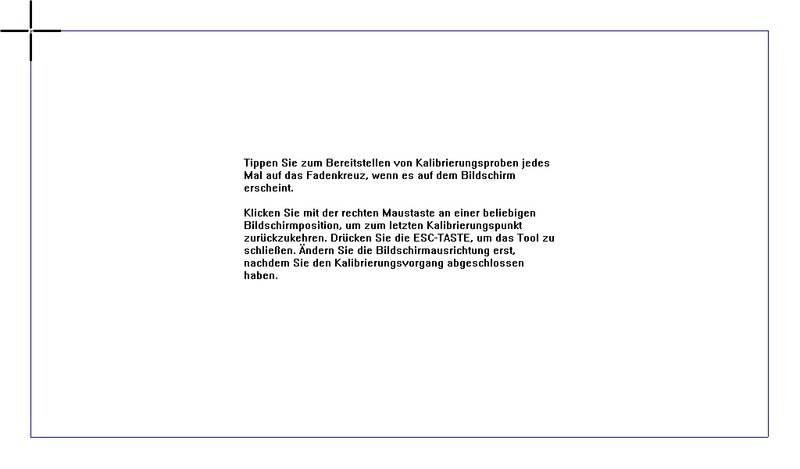 It also supports a resolution of 1024 x 768, but this results in a distortion of the picture. We took a variety of readings to assess the quality of the screen but the results were patchy. On the one hand it had a very good black value of 0.17 cd/m² and an excellent contrast ratio of 672:1. On the other hand, the brightness was not distributed evenly across the screen's surface, giving a mediocre uniformity value of 69%, and the average brightness was awfully low at 93.6 cd/m². 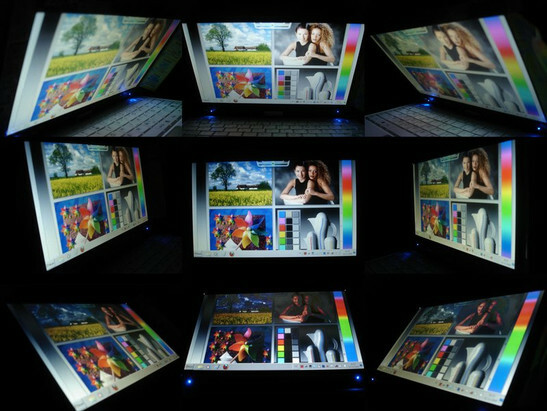 You can also tell just by looking at it that the screen is very dim, although it does display colours fairly strongly and naturally. 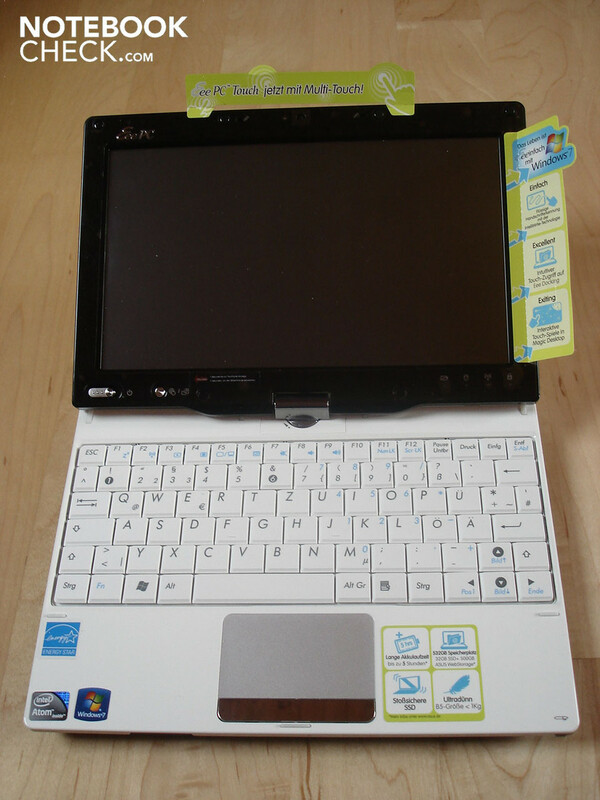 The popular Eeectl tool, which allows you to overclock various components such as the CPU and to adjust the fan speed and screen brightness, refused to work throughout the course of our testing, and so we could not artificially dial up the screen brightness, as we have been able to with other Eee PCs without a problem. Unfortunately the display looks grainy (probably as a result of the touch-sensitive screen coating). 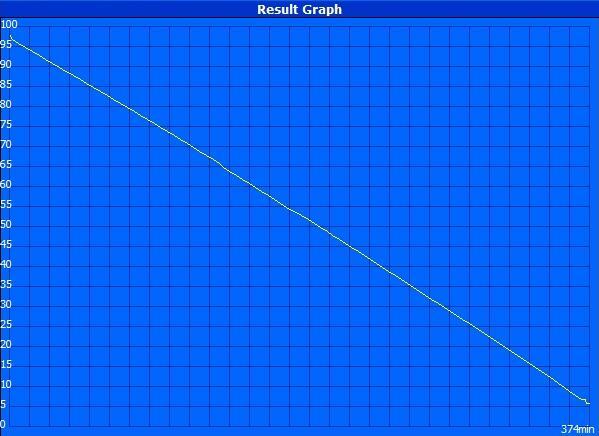 Another criticisim would be that the screen reflects very noticeably if it is poorly positioned (opposite a window for example) or exposed to strong light, even indoors. This makes the T91 MT wholly unsuitable for outdoor use; the screen is almost entirely unreadable due to the extensive reflections and poor overall brightness. This is a real shame, as the T91 MT would otherwise have been perfect for use outdoors, with its low weight, compact design, practical tablet function and, as we will see later, solid battery life. While the horizontal viewing angles are quite acceptable, even small changes in the vertical direction give rise to deviations in brightness and colour. As a result it is often necessary to keep adjusting the screen. Asus has most definitely not prioritized the performance of the T91 MT, focusing instead on using the least expensive and most energy-efficient components. 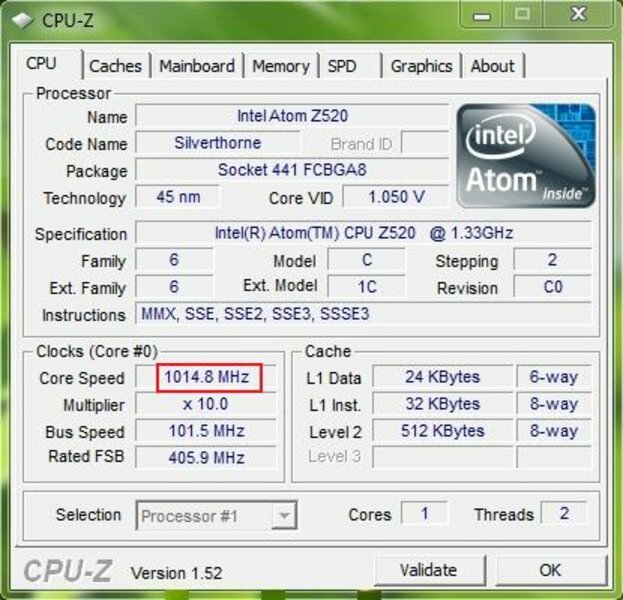 The CPU is an Intel Atom Z520, a single core, 1.33 GHz processor made using the modern 45nm process, with 512 KB L2 cache and 400 MHz FSB. Its energy consumption at 2 Watts is pretty much as low as it gets. For instance, Intel's Core 2 Duo SU9300 (1.20 GHz, 3 MB L2 cache, 800 MHz) which is also considered frugal in its energy needs and is often used in portable, ultra-low voltage notebooks, consumes around 10 Watts, five times as much. But back to the Atom Z520. 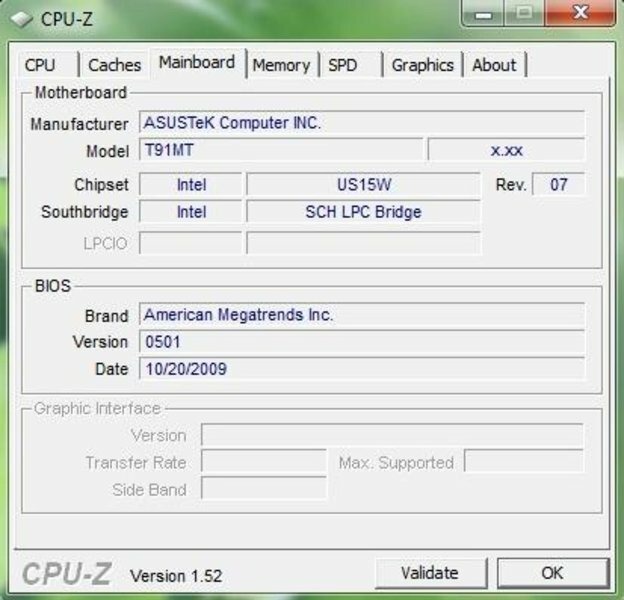 It may not support a 64-Bit system, but its so-called hyper-threading technology simulates the effect of an additional CPU core, so that the Z520 appears as a dual core processor under Windows Task Manager. 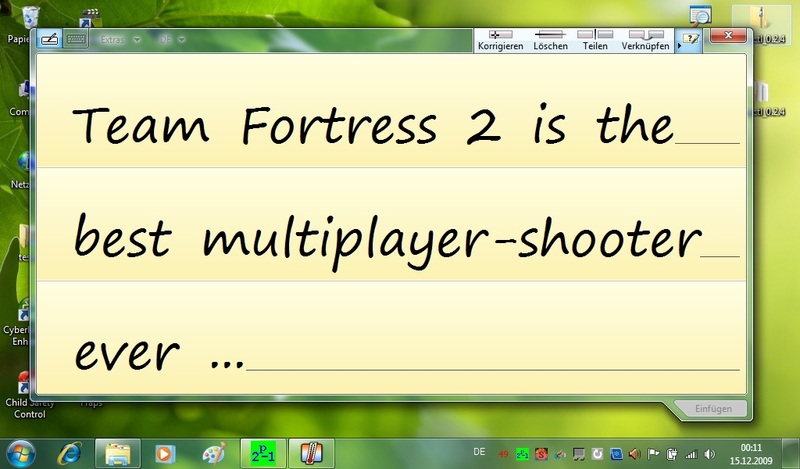 The notebook has only 1 GB of DDR2 RAM, and runs with the 32-Bit version of Windows 7 Home Premium operating system. 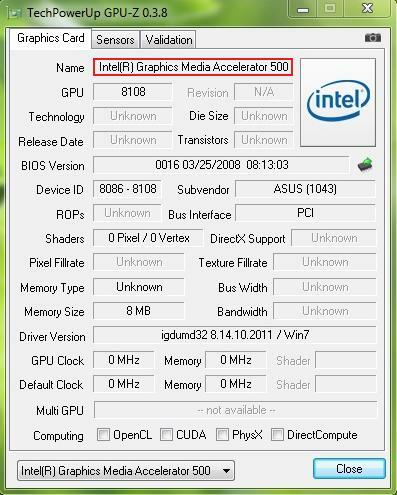 The graphics card is also by Intel, bearing the unwieldy name of Graphics Media Accelerator 500. It is actually an onboard graphics chip without its own memory; it does support DirectX 10.1 but is very low-performance, with a low clock speed and Unified Shader model 4.0. With the help of the integrated video decoder it is at least able to decode high-resolution videos in MPEG-2, VC-1 and AVC formats. The GMA 500's 130 nm finishing process may seem practically medieval; however, the performance level is generally sufficient for normal everyday use. Asus has equipped the T91 MT with a practical system called Super Hybrid Engine, with which you can conveniently switch the CPU between three levels of speed. While the Atom Z520 has a speed of around 1015 MHz in power saving mode, it runs at the standard 1333 MHz in high performance mode. Super performance mode allows you to mildly overclock the processor to 1390 MHz. In practice this overclocking of around 57 MHz does not really help with the main problem of the T91 MT, namely its poor overall working speed. The combination of Windows 7, low-performance components and the bloated installation (around 60 programs, many of which run automatically upon start-up) is simply too much for this tablet. Start-up and shut-down can take a painfully long time, and using multiple applications at the same time (multi-tasking) tests one's patience to the limit and should be avoided altogether, as it leads to substantial jerkiness and delays. On top of this, the time it takes to install and load applications is tediously long. In addition the notebook has problems coping with graphically demanding programs, and high-resolution videos seldom run smoothly. With the help of our tips you can master these speed issues to some extent at least. First we recommend that you uninstall all the unnecessary bloatware and turn off auto-start for the numerous applications which appear in the corner of the taskbar. 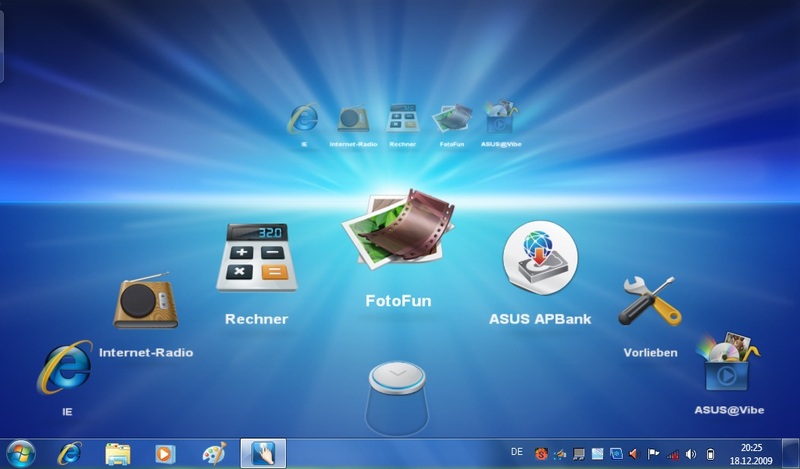 After that we would advise you to deactivate the attractive but resource-intensive Windows Aero effect, by doing the following: go to Control panel/ System and security/ System, and on the left sidebar click on Advanced system settings; then under Performance click on Settings and select 'Adjust for best performance'. This brings the visual effects down to a Windows 95/98 level, but retains all the convenient functions of Windows 7. 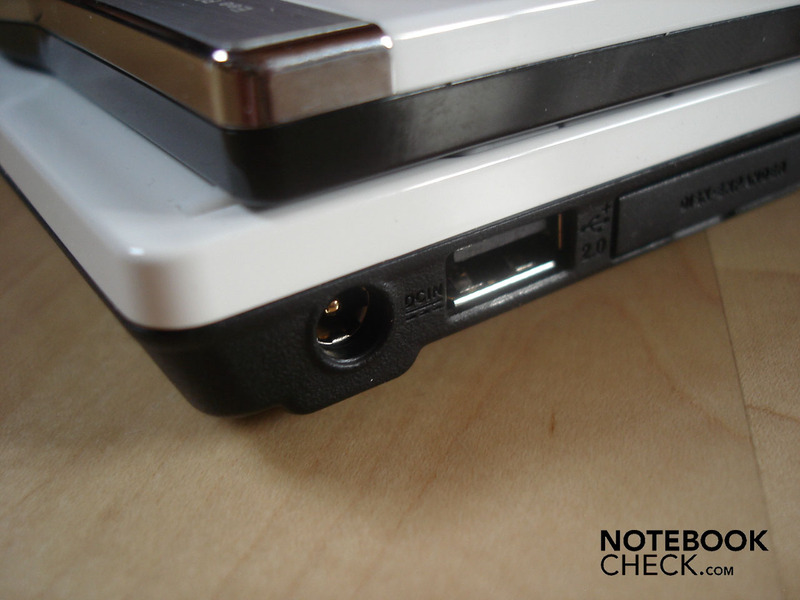 Final tip: if possible set the notebook to the 'high performance' power plan. Now we come to the benchmarks. In the processor-intensive Cinebench R10 the Atom Z520 achieved, with difficulty, 466 points in the single core and 706 in the multi-core rendering. 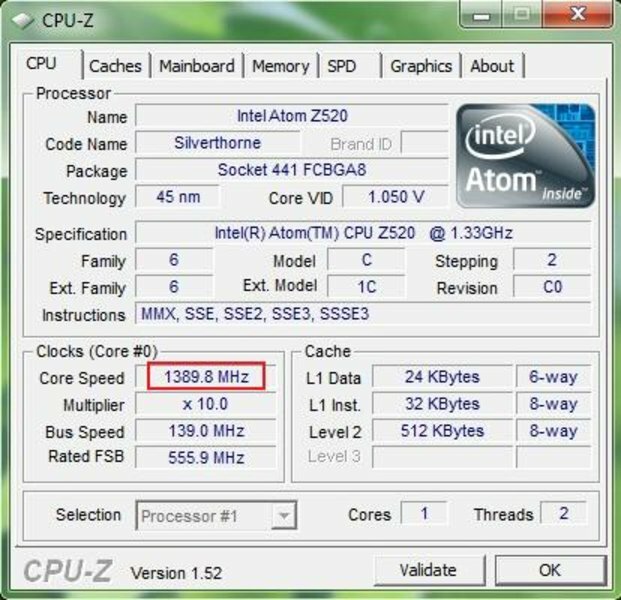 The 'standard' CPU for netbooks, the Intel Atom N270 (1.60 GHz, 512 KB L2 cache, 533 MHz FSB), does not work much faster at 540 points for the single core and 831 points for the multi-core rendering. In the PCMark05 benchmark, the T91 MT just managed 1183 points. The Dell XT2 tablet which we recently tested, with its Core 2 Duo SU9400 (1.40 GHz, 3 MB L2 cache, 800 MHz FSB), is four times as fast with 4635 points in PCMark05, but it also costs more than three times as much. In the older 3DMark01 the GMA 500 just manages to scrape past the 1000 point mark, but in 3DMark03 it stuttered continuously, and only reached 363 points. 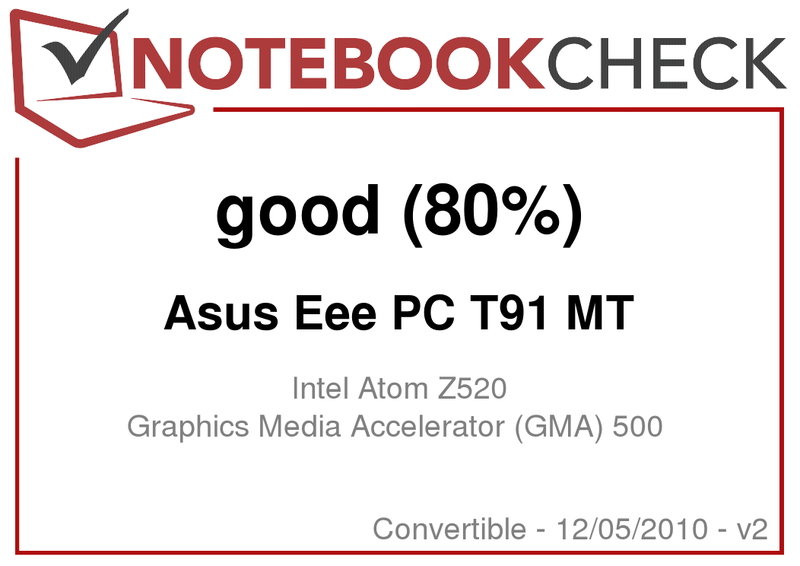 The GMA 950, which is frequently used in netbooks, achieves 3872 points in the 3DMark01 test, about three times as high, and in 3DMark03 about twice as much with 619 points. 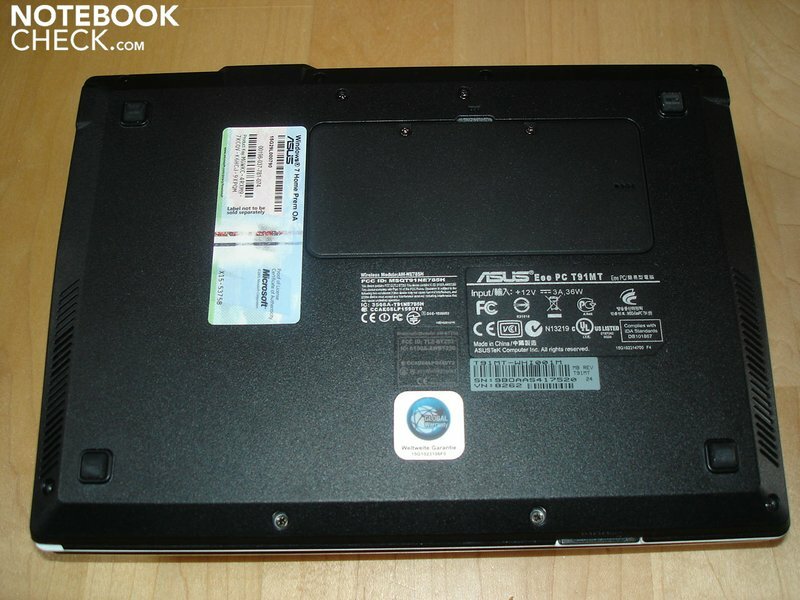 The hard drive is a 32 GB SSD also made by Asus. The great advantage of this integrated solid state drive is its excellent access time of 0.3 ms. Normal hard drives mostly lie in the region of 16.8 ms. 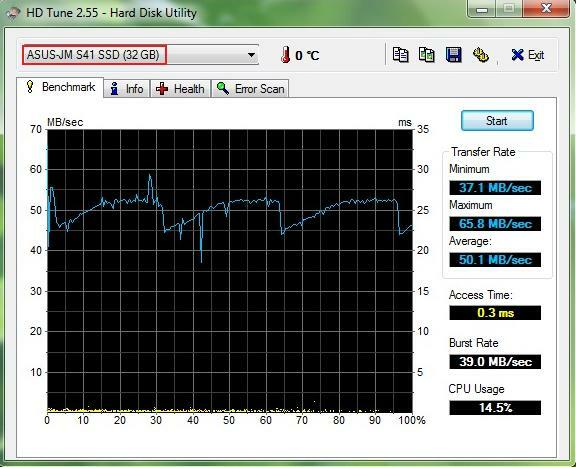 The average transfer rate is 50.1 MB/s, on a par with an ordinary HDD. The burst rate is more disappointing in comparison to normal hard drives, at 39.0 MB/s. So overall the SSD provides decent but not outstanding performance. 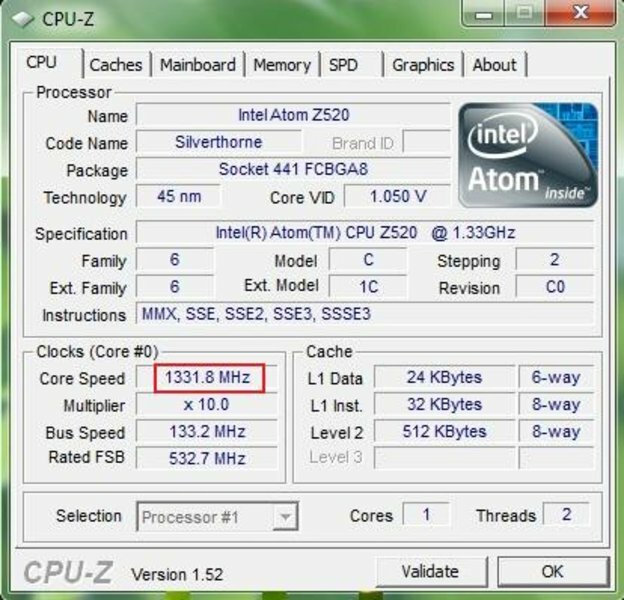 In the Windows 7 performance index, the processor achieves a lowly score of 2.1 points from a possible 7.9. 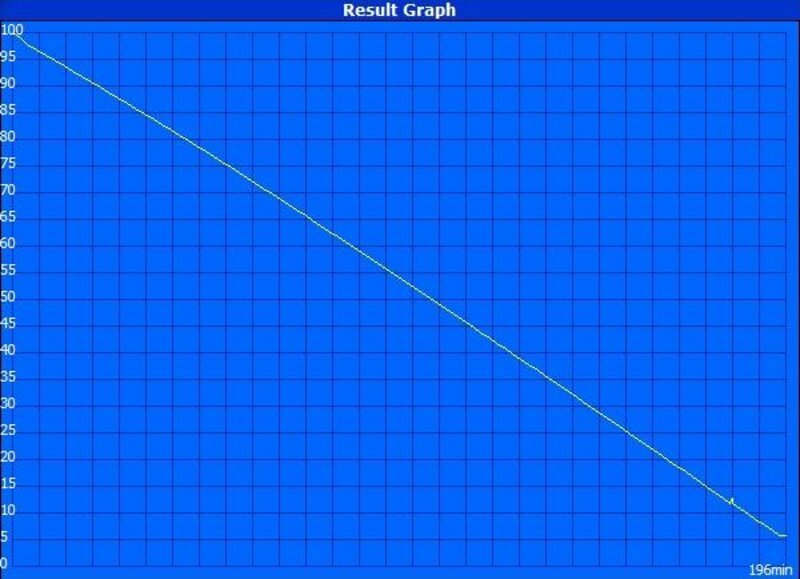 The score for 3D business and gaming performance is not much better at 2.3 points. In the categories for memory (RAM) and desktop performance for Windows Aero it achieves a middling 4.3 and 4.5 points; while the integrated SSD achieved the best score with 5.9 points. 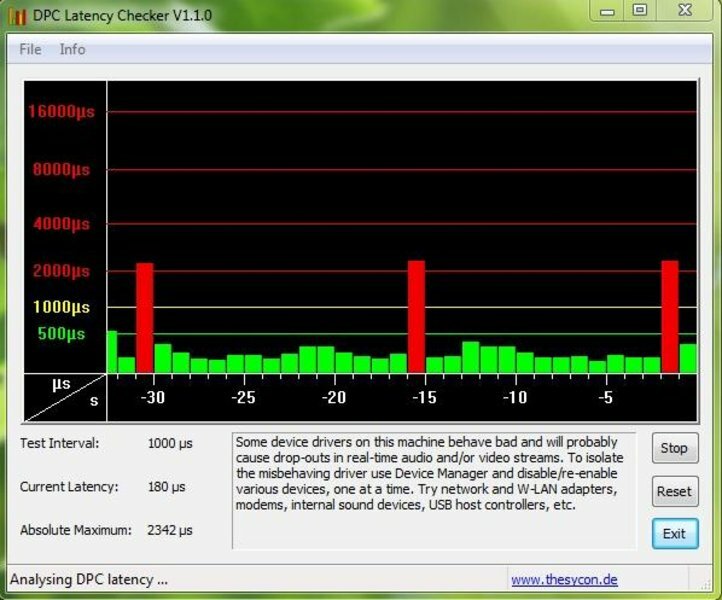 If the latencies of an operating system are too high, it can lead to problems when external devices are connected (such as crackles of sound with an external soundcard). 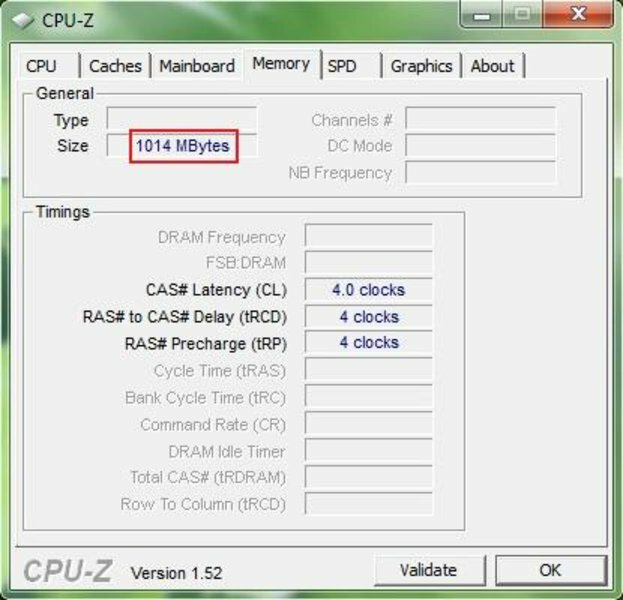 High latencies are often caused by defective drivers or ones that have been badly programmed or optimised. The T91 MT's latencies remained mostly in the green (under 500 µs) but did shoot up to around 2000 µs from time to time. One of the great things about the T91 MT is its low system noise. As the tablet has no cooling fan and uses a solid state hard drive (no head), the T91 MT is always completely inaudible at 28.8 dB(A). Even if you hold your ear right up to the casing, there is nothing to be heard other than a very quiet purring. This makes for a great working environment. 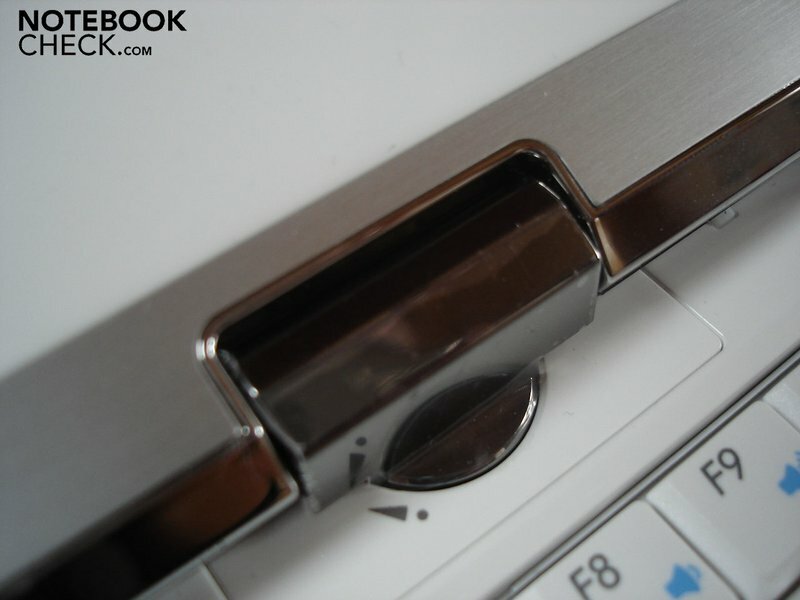 In idle mode (maximum energy-saving options enabled) the laptop stays cool, with a maximum of 34.6 °C on the upper side and 32.6 °C on the underside. 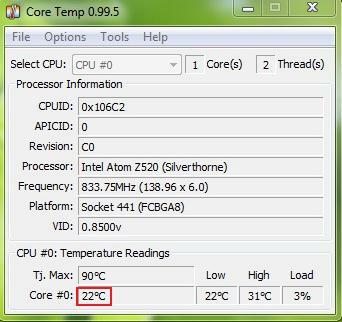 Under stress (GPU and CPU) the temperature on the upper side rises to 38.1 °C, with the palm rest area reaching a maximum of 32.4 °C, still an acceptable temperature. The underside can get as high as 43.3 °C under stress, but as most of the T91 MT's users won't be using such demanding applications very often, this kind of temperature will not be troubling them much in practice. 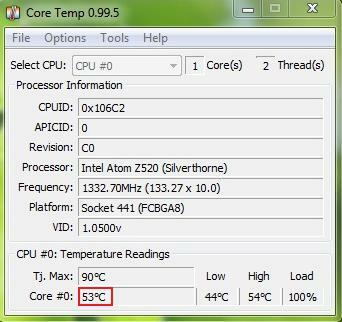 The CPU remains at an excellent temperature, at around 22 °C in idle and 53 °C under heavy use. Quite an achievement when you consider that there is no fan in the casing. (+) The maximum temperature on the upper side is 38.1 °C / 101 F, compared to the average of 35.4 °C / 96 F, ranging from 21.8 to 55.7 °C for the class Convertible. The sound quality was actually pretty good; while of course it cannot compare to larger notebooks, it is definitely acceptable for something the size of a netbook. The frequencies are pretty well balanced and so there is nothing to stop you listening to the odd piece of music or watching the occasional video clip. But it is recommended that you connect up some external speakers, as the bass sounds are quite washed out, the maximum volume is seriously limited, and you quickly get breaks in sound if the laptop is too busy. Also the sound quality is somewhat tinny and lacking in volume overall. The battery life of this lithium polymer battery is very respectable. In the Battery Eater Classic Test the notebook survived a decent 3 hours and 16 minutes at maximum screen brightness and with no energy-saving options enabled. 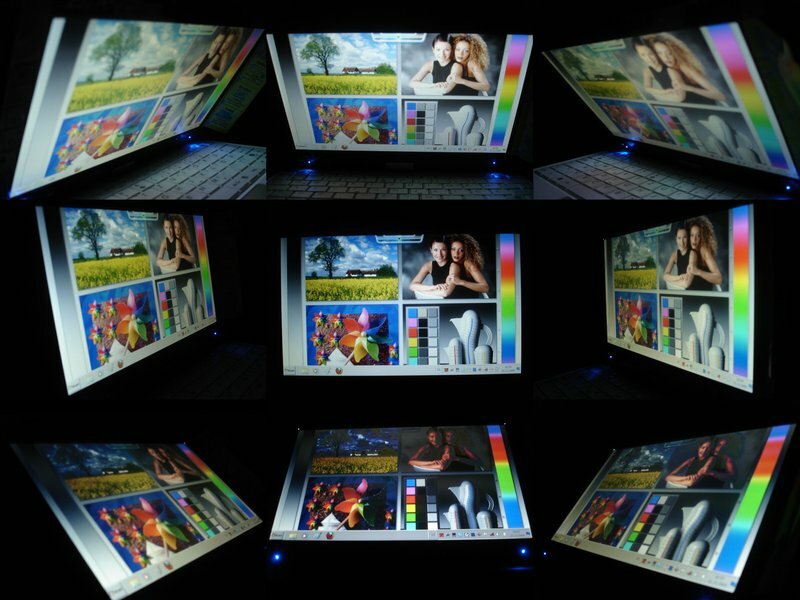 During playback of a film in AVI format (since there is no DVD player due to space constraints) the T91 MT gave out after 3 hours and 40 minutes, with maximum screen brightness and some energy-saving functions. So even overly long films can be watched in their entirety without a problem. While using the WLAN to surf the internet, the tablet almost cracked the 4 hour barrier with 3 hours and 57 minutes. In the Battery Eater Readers Test, this time with minimum screen brightness and maximum energy-saving options, we had to return to mains power only after a full 6 hours and 14 minutes. The T91 MT isn't really up to the standard of ultra-portable marvels like Acer's Timeline-Serie von Acer or netbooks like the Asus 1005HA-M, but the battery run times are more than acceptable. The only downside is that the battery is integrated into the casing and so it can't simply be taken out or replaced by the user. The tablet's energy consumption is worth mentioning; at 4.9 to 6.2 Watts in idle and 7.9 to 9.0 Watts under heavy use, it is hard to rival. It also draws only 0.2 Watts of power when switched off and 0.3 Watts in standby. 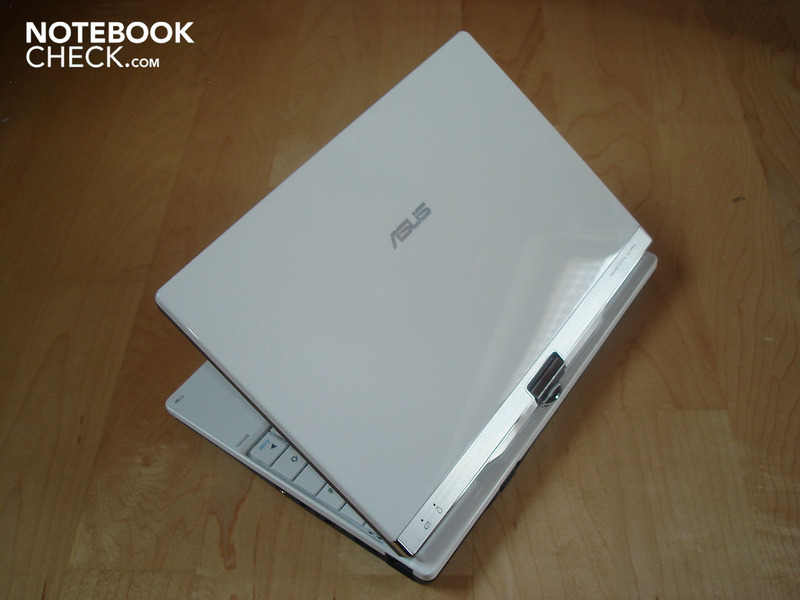 The Asus T91 MT leaves a very mixed impression. On the one hand you have its practical and reliable tablet functionality, relatively accurate multi-touch capability, and strong handwriting recognition, all of which make the notebook a pleasure to use. The smart design, compact size, low weight and intuitive software will also put you at your ease. Other advantages are its very respectable battery life, cool surface temperatures and consistently low background noise level. On the negative side, the T91 MT has a rather dim and grainy display, which is not really suitable for outdoor use on account of the strong reflections it picks up. The tablet is also lacking in terms of performance, with the operating system growing fairly sluggish even under moderate use. One reason for this is the bloated software installation. 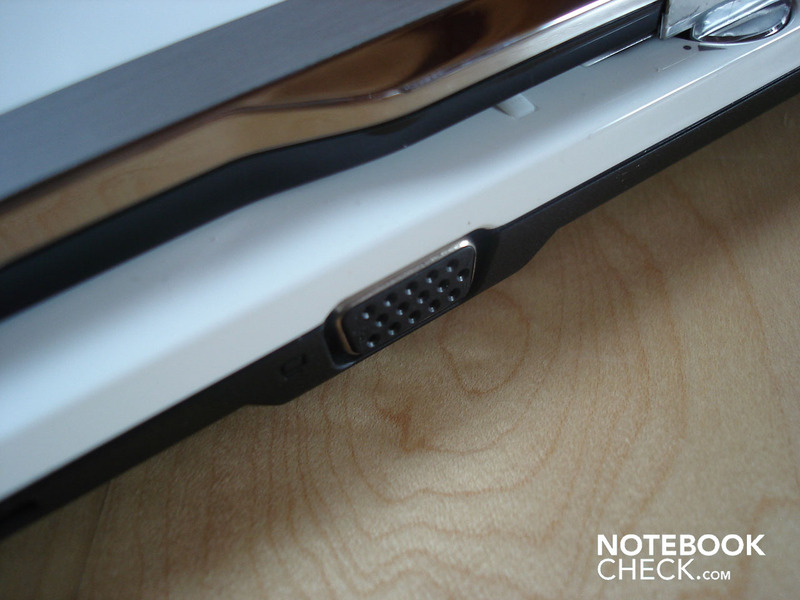 Further problems include the limited range of ports (no HDMI) and low capacity of the SSD hard drive. In addition, the keys are really very small, leading to frequent typing errors. If you are looking for a small and affordable tablet notebook for indoor use, the T91 MT is certainly worth a closer look. 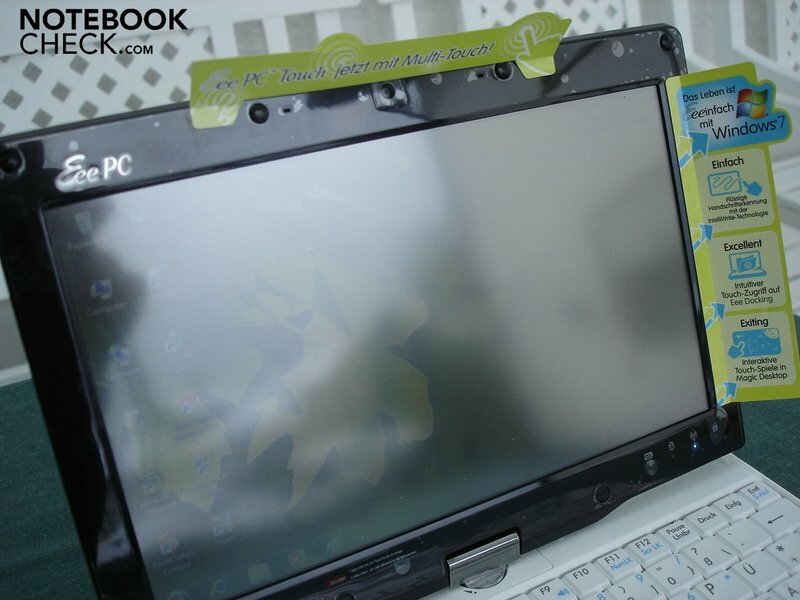 If, however, you want a high-performance tablet which is of high-quality in all respects and suitable for use outdoors, this is not the notebook for you. This travel case, which is included, is made from a very soft material and is well finished. The notebook is exceptionally intuitive and easy to use, thanks to its practical tablet functionality and touch-sensitivity. 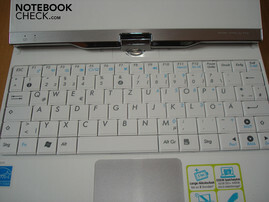 Its handwriting recognition is reliable and inputting information by touch works very accurately. A brighter display, better sound quality, larger keys and a few more ports. The combination of weak hardware, deliberately bloated installation and Windows 7, which leads to an unpleasantly slow working speed. 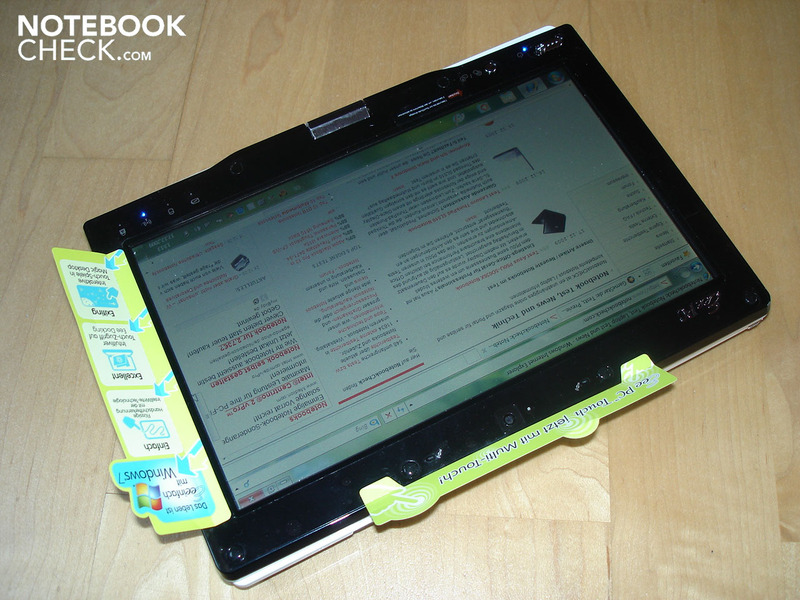 Tablets like the Dell Latitude XT2 or the Unimall Classmate. 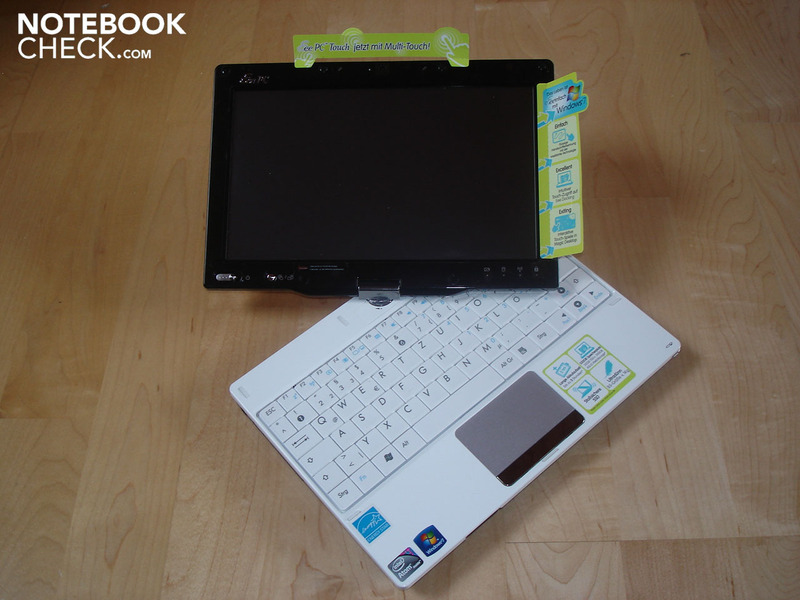 Subnotebooks like the Acer Aspire Timeline 1810TZ, the Acer Ferrari One 200, the Acer Aspire 3810T/4810T, the Samsung X420, the Asus UL30A, the Dell Inspiron 11z, the HP Probook 5310M or the Packard Bell EasyNote Butterfly. 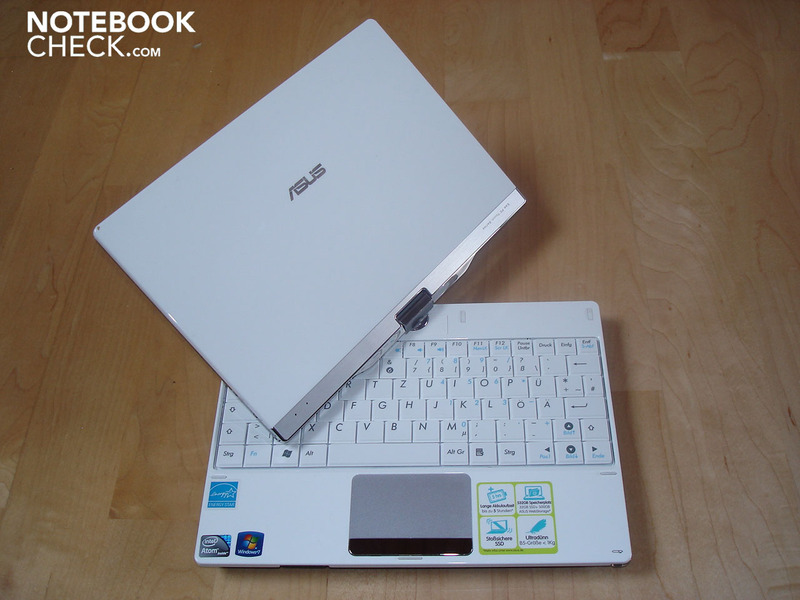 Netbooks like the Asus Ee-PC 1005HA-M/1008HA, the Samsung N120, the Toshiba NB200, the Sony Vaio W11 or the Dell Latitude 2100.